R.I.S.E. station sites provide ample room for wheelchair access and allow school children the opportunity to study the network. When the South Jersey Resource Conservation and Development Council, Inc., was challenged to provide a fast and convenient irrigation water management plan to area farmers and, later, to area homeowners, Campbell Scientific, Inc., (CSI) quickly entered the picture. It was 1993 and the Council, a 501(c)(3) nonprofit organization, was building the foundation for its Resource Information Serving Everyone (R.I.S.E.) network. The network’s primary focus was, and remains, agricultural water conservation, but grew into a multi-function undertaking when a secondary objective of fulfilling an Environmental Protection Agency (EPA) requirement for an in-kind local water conservation project near a Superfund Site, and later an objective addressing watershed modeling, were added. R.I.S.E. stations are currently distributed throughout eight of New Jersey’s 11 southern counties. Now, with a total of 17 weather stations and four water-quality stations spanning much of southern New Jersey, CSI remains at the heart of a system upon which water managers, farmers, homeowners, and researchers have learned to depend. 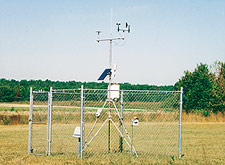 Weather stations within the R.I.S.E. network are based around a CR10X Measurement and Control System, which measures temperature and humidity with a Vaisala HMP35C or HMP45C temperature and humidity sensor, solar energy with a Li-Cor LI200S or LI200X pyranometer, wind speed and direction with an R. M. Young Wind Sentry Set, and rainfall with a TE525 or TE525WS tipping bucket rain gage. Sensors are measured every 60 seconds and output occurs hourly, every six hours, and daily. Conditional outputs document rainfall every six minutes during an event. Data are retrieved daily via telephone modems connected to each weather station. To maximize the benefits of the collected weather data, the Council incorporated the Penman-Monteith Evapotranspiration (ET) formula into each datalogger’s program. This allows for the approximation of the amount of water used by the turf under each weather station. Using crop coefficients developed by various researchers, and soil moisture numbers calculated by the USDA Natural Resources Conservation Service, the user can develop his or her own irrigation water management concept for their particular agricultural crop. These numbers can be found in the Council’s website at www.sjrcd.org. Of particular interest to New Jersey researchers in watershed protection and management, are the network’s rainfall measurements. More specifically, the six-minute subset of rainfall is output during rain events. That provides our clients a detailed view of rainfall that was never before available. In response to the rapidly dwindling supply of fresh water, the Council was asked if the CSI system could help with a homeowner water conservation program. Working with the local water company, United Water Toms River, the Council installed a CSI weather station and helped develop a lawn-watering program aimed at homeowners. An ET amount and an approximation of minutes to run a hose-end or in-ground sprinkler system is provided daily to the local cable TV system, one radio station, and the local newspapers. This activity resulted in an approximate 1 million gallon per day reduction in peak daily summer water requirements throughout this water system. Once R.I.S.E weather stations record their data, customer-developed forms, including the typical SPLIT parameter files found in CSI’s PC208W software, make it manageable and easy to read. From its inception, the R.I.S.E. network has greatly eased South Jersey RC & D Council’s challenge of providing area farmers and homeowners with important information required for effective irrigation water management. The system, now easily accessed via the Internet, allows the Council to gather instantaneous data for access by its many subscribers as well as to rebroadcast much needed irrigation information to local television, newspaper, and radio station audiences. Building on its initial goals, the South Jersey RC & D Council, Inc., has expanded into watershed monitoring in its pursuit of supplying useful, pertinent information to those who can have an impact on resource conservation. Finding weather data to be just part of its environmental monitoring needs, the Council expanded its presence by selecting CSI water-quality stations to provide related environmental data needed in the area. Using a Campbell Scientific CR10X Measurement and Control System, each water-quality station includes a VMT Water Velocity Sensor, pH probe, OBS3 Turbidity Monitor, Oxyguard Dissolved Oxygen Probe, shaft encoder, Vaisala HMP45C Temperature and Humidity Probe, TE525WS Tipping Bucket Rain Gage, and a phone modem. The sensor assemblage allows each station to contribute to a clear understanding of the hydrologic dynamics and manmade influences on the Upper Cohansey Watershed in New Jersey’s Cumberland County. Weather and water quality stations monitor parameters for irrigation planning and water conservation. So. Jersey Resource Conservation and Development Council, Inc.